Wilde Pedique nail reconstruction is a wonderful way of improving the look of thickened, damaged or fungally infected toe nails. 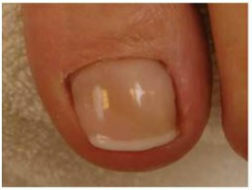 It conceals imperfections such as ridges and splits and reconstructs missing parts of a nail providing the appearance of a normal healthy toe nail. The elastic gel used in nail reconstruction is cured under a UV light, and whilst adding strength and durability to the nail, its unique bonding properties and flexibility means it moulds itself perfectly to the underlying nail impression, giving the feeling of a completely natural nail. 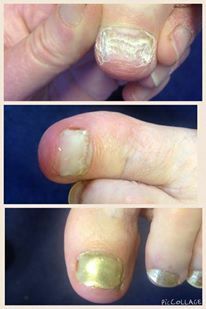 Nail reconstruction is suitable for both men and women. It is an odourless, non-porous, hypo-allergenic product, which is not affected by water or nail varnish remover. It hardens to either a glossy or matt finish, which can be treated in the same way as a natural nail i.e. filed, cut, and painted using standard or gel polish. The ‘prosthetic’ nail is designed to ‘grow out’ with your natural nail and therefore can be repeated whenever you want your nails looking healthy (perfect for holidays, swimming and special occasions). The treatment is relatively quick (two big toe nails takes up to 30 mins), completely painless, and is the ideal solution for anyone with unsightly toe nails. Nail reconstruction costs £30 (£20.00 when included with a spa pedicure) for one nail, £40.00 for two nails (£50.00 when included with a spa pedicure). There is no need to be embarrassed and hide your nails in shoes & socks, simply contact us today and request an appointment with Caroline for “Nail Reconstruction” and we will make your unsightly toe nails look healthy!